The degree of transparency can be changed to reveal apps in the background. 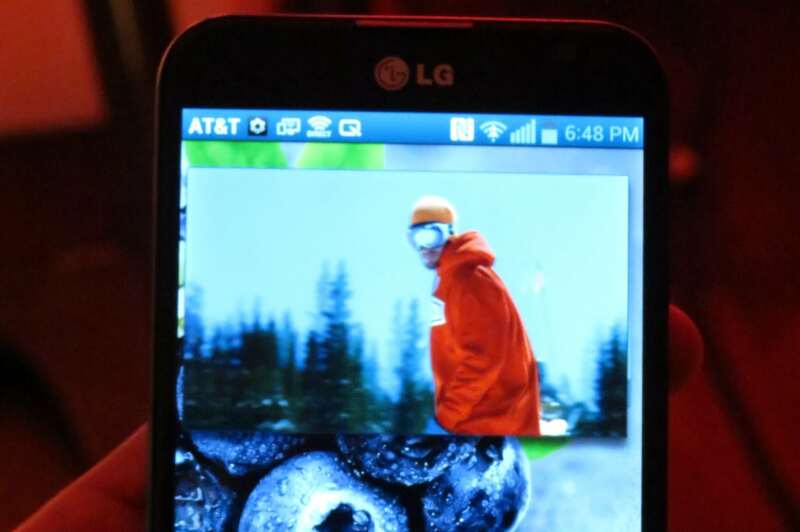 Menu screen for the Optimus G Pro. The G Pro features a 5.5-inch, 1920x1080 resolution screen. 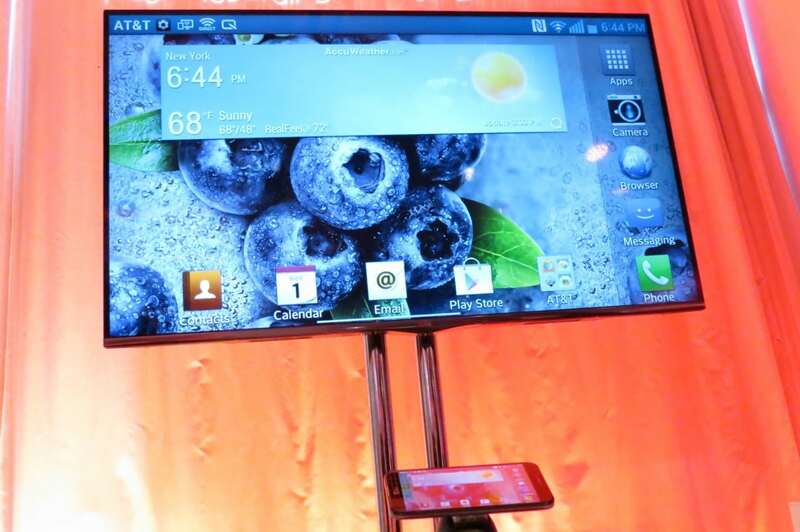 The Optimus G Pro can share content live with TVs over Wi-Fi. 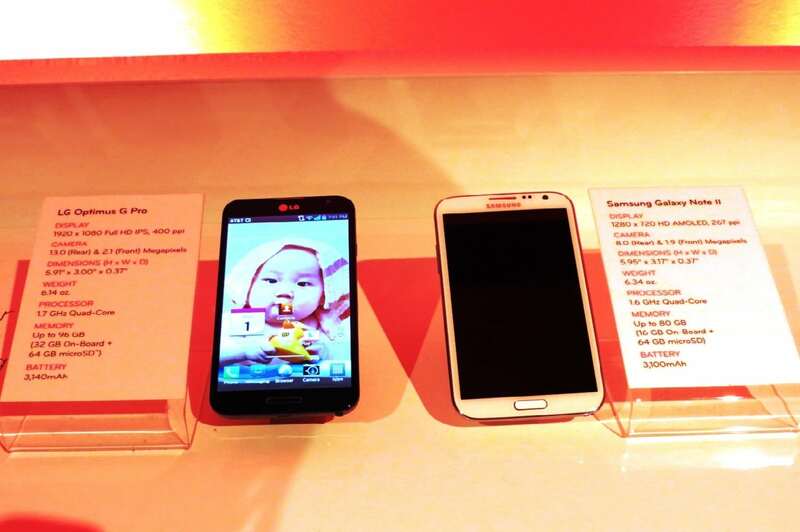 Optimus G Pro compared with the Samsung Galaxy Note II. Media can be resized and moved around the home screen. 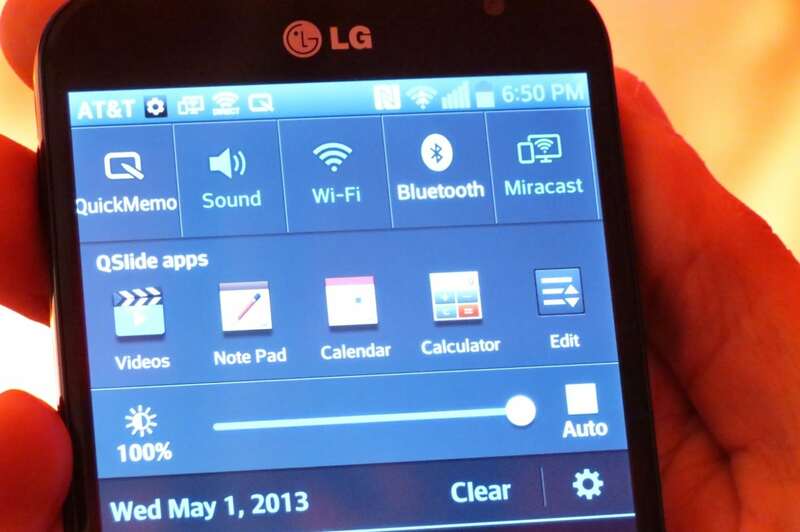 Details on the LG Optimus G Pro. 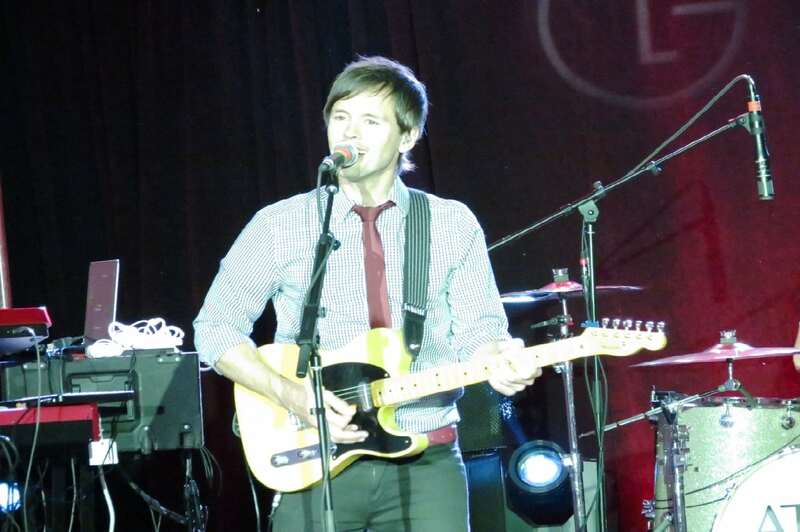 Atlas Genius front man Keith Jeffery performs at the Optimus G Pro debut. 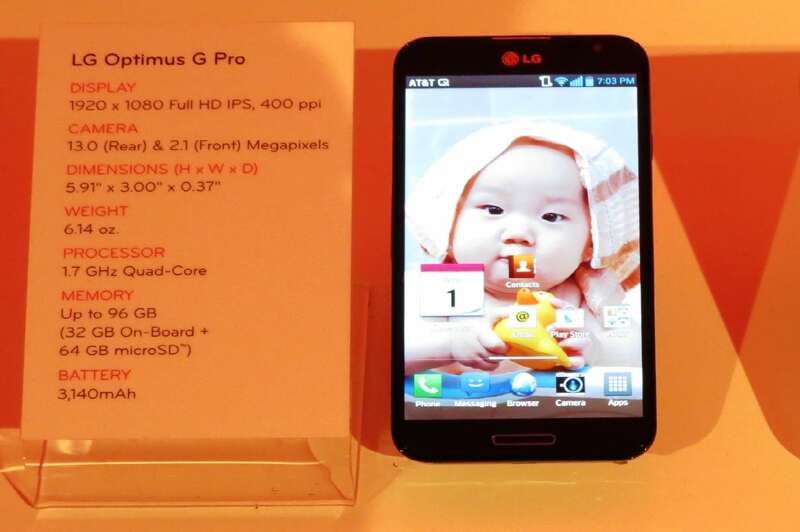 Trumpeting the upcoming debut of the Optimus G Pro phablet, last night LG Electronics brought the press, analysts, and other guests to the Metropolitan Pavilion in New York to check out the device. With dusky lighting and indie rock band Atlas Genius taking the stage part way through the night, the company tried put some dazzle on its latest device and strip some of the gloss off of competitor Samsung. 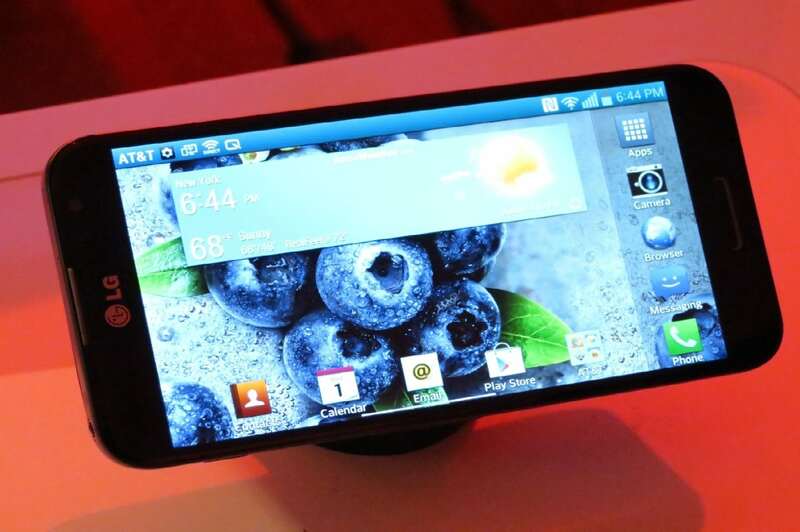 The AT&T-exclusive G Pro, to be released in about a week, is the big brother to the Optimus G smartphone, which was released last November, with a larger display, an amped up processer, and some software upgrades. LG Electronics, which has its U.S. headquarters in Englewood Cliffs, NJ, is not-so-subtly pitting the G Pro against Samsung’s Galaxy Note II, which went on the market last fall. Inside the G Pro is a 1.7 GHz Qualcomm Snapdragon Quad-Core 600 Processor, 2Gb of RAM, 32 GB of internal memory, and a memory slot for up to 64GB of extra storage. It runs the latest version of Google’s Android operating system, called Jelly Bean (4.1.2). More of the device’s specs can be found here. For those interested in comparing stats, the Note II’s details are here. The short take is that the G Pro’s processor has more cylinders under the hood. But it will require a real shakedown of both devices to tell which performs various tasks more smoothly. In terms of apps for productivity, the G Pro comes equipped with Polaris Office 4 for writing and editing spreadsheets, documents, and presentations. That gives it some out-of-the-box potential use for the business world. 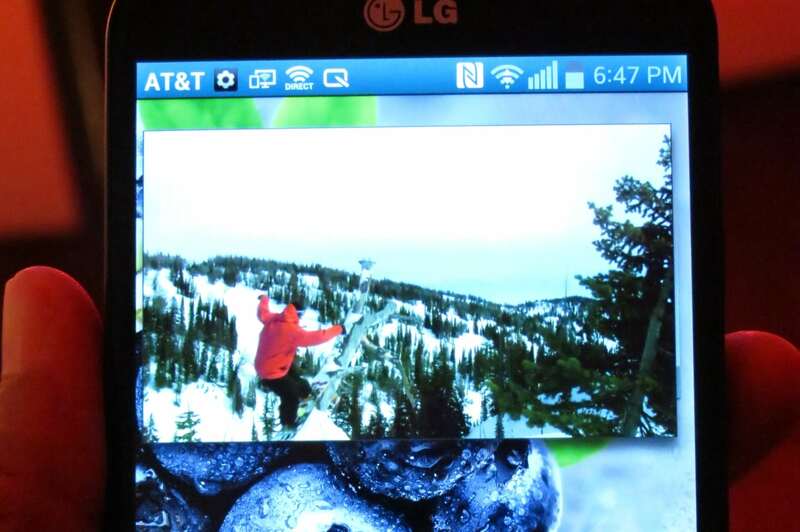 The QSlide 2.0 multitasking function lets users run multiple apps, from a set list, simultaneously on the home screen. You can resize and change the transparency of each app, letting these windows overlay while they are in use. There is also feature called VuTalk that lets users take and share notes during voice calls—so long as they use compatible devices. The G Pro includes some features that Samsung—which has its North American headquarters in Ridgefield Park, NJ—has already ballyhooed, such as sharing info between devices through near field communication. G Pro users can also shoot video from the front-facing 2.1-megapixel and the 13–megapixel rear cameras simultaneously, letting them record their own reactions to what they are watching. Sharing media over Wi-Fi with televisions is rather standard with the latest generation of mobile gadgets; the G Pro also has a remote tuner that lets the phablet manipulate multiple nearby devices from a plethora of manufacturers (and apparently can be used to hijack control of TVs in sports bars—but this is not advised). Preorders for the G Pro, priced at $199 with a two-year contract, start this Friday with the scheduled release set for May 10. That said, it is hard to ignore the fact that Samsung’s Galaxy S4 smartphone arrived recently with much fanfare on the market. From phablets to classic smartphones, competition to be the mobile device in consumers’ hands continues to intensify in all shapes and sizes. I am in fact glad to read this web posts which carries tons of helpful facts, thanks for providing such statistics. Hi there, How’s it going? Just shared this post with a colleague, we had a good laugh. Thanks! Keep on posting! Good day! I simply wish to give a huge thumbs up for the great information you have explained right here on this post. This article was great, i was reading it and i find it very interesting. Great post! I was reading it and I find it very interesting. One of the few articles I’ve read today that said something unique! Nicely presented information and I find it very interesting. Great post! Thanks so much and let keep on sharing your stuffs. It is a nice article. I have found useful facts in here. Thanks to the author for providing such information. Nice post. This article is interesting. I have read useful informations and facts. Keep on posting! Excellent! Here have many exclusive information that I found. Thanks admin to share such an interesting site. Thank you for this nice article. Many useful informations and facts can be found here. Thanks to the author for providing such post. We should thank the author for creating this kind of article. Keep it up! Excellent along with beneficial post. I have been checking out several of your stories and I ought to say nice stuff. Interesting article! I’m going to visit your site more often to see and read related articles about these. Visit my site too and learn more about plumber glen waverley. Good day! I simply wish to give a huge thumbs up for the great information you have explained right here on this post. Thanks! Visit my site too and learn more about carpet cleaning canberra. Thumbs up for your article. Thanks for the great information you have explained right here on this post. I would visit this site more often. Drop by at my site too and learn more about excavator hire Melbourne. Thumbs up for your article. Thanks for the great information you have explained right here on this post. I would visit this site more often. Thank you! Drop by at my site too and learn more about excavator hire Adelaide.